I’m basically on semi house arrest while monitoring the pregnancy, so my sister delivered dinner to us the other night – how thoughtful! 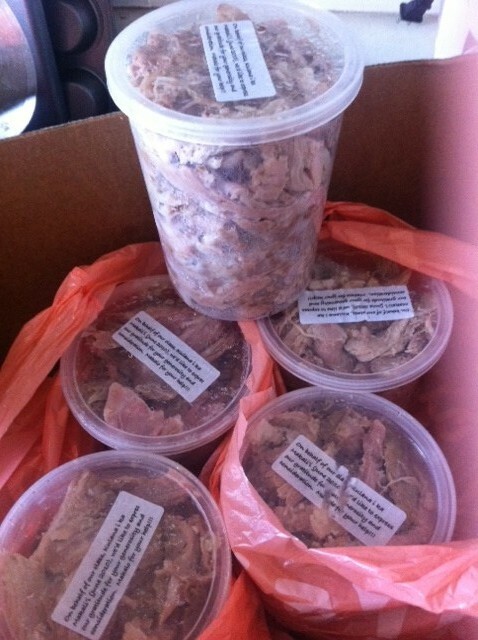 As part of a fundraiser, she bought lots of kalua pig cooked up in a friend’s imu and made kalua pig & cabbage. 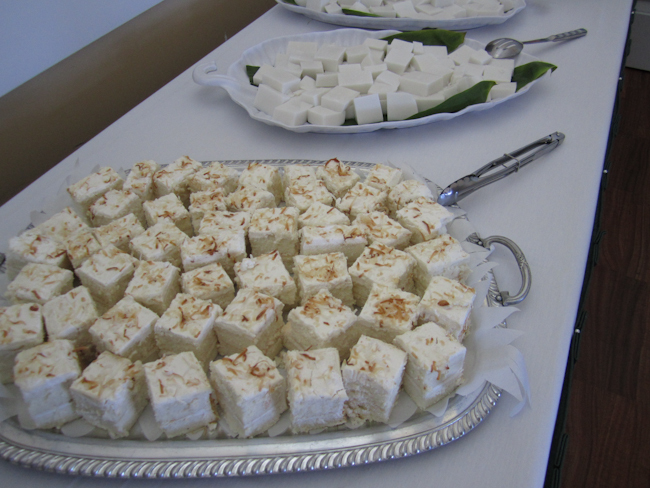 To go with it, she also made some chicken long rice, haupia, and my favorite, poi! 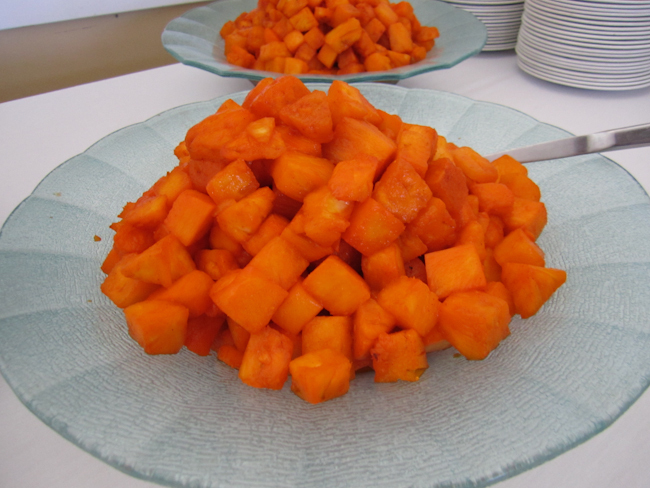 It’s been so long since I’d eaten Hawaiian food, I’d forgotten how much I love it. 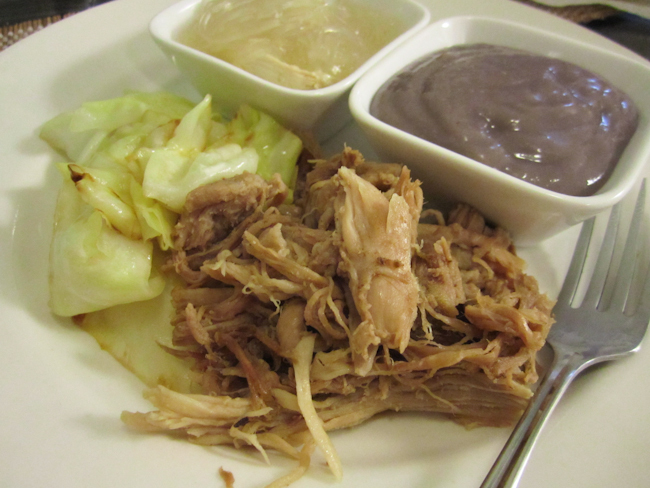 Poi’s gotten pretty expensive over the years that we usually just eat kalua pig & cabbage with rice, so it was such a treat to have poi with my kalua pig. 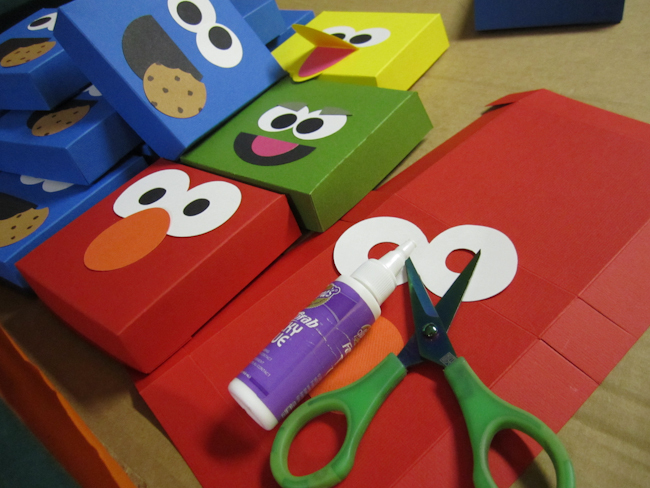 A few weeks ago, I was enlisted to help a dear friend with preparations for her son’s 1st birthday party. 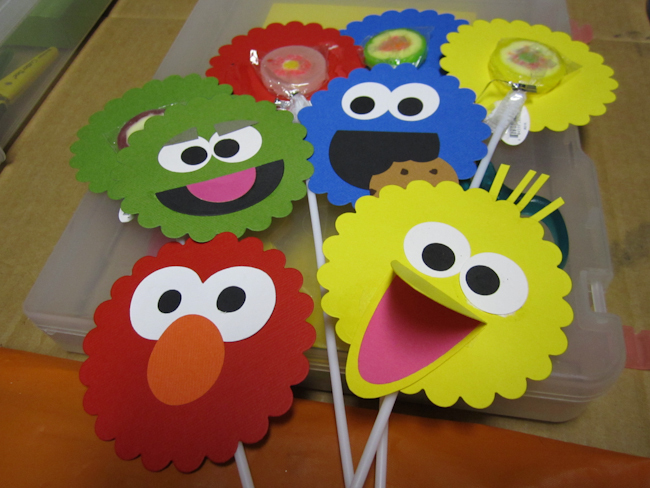 The theme was Sesame Street, filled with pops of bright colors and fun characters. Her mother is an amazing crafts-woman and gave us step-by-step instructions for assembling the favors. 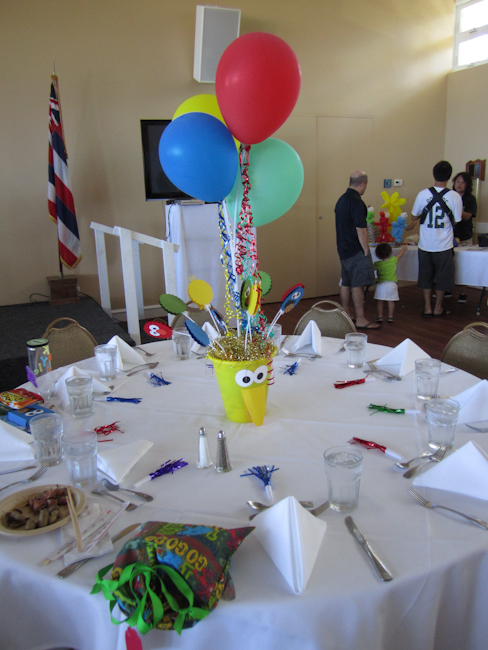 1st birthday celebrations are big here in Hawaii, and this party was no exception. 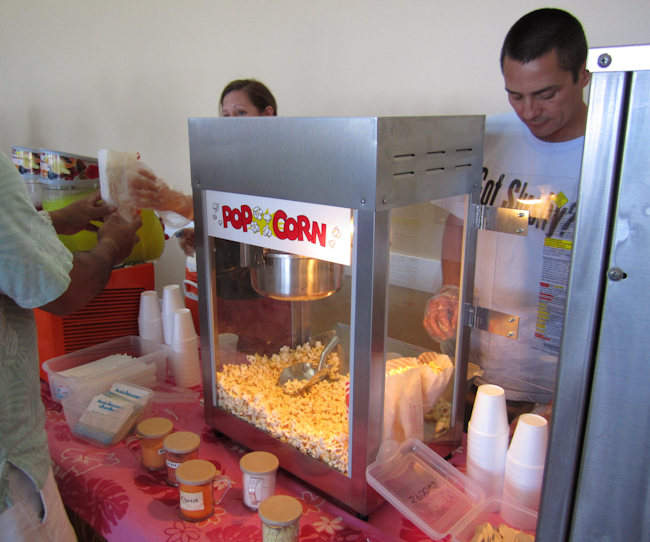 My friend and her hubby hosted 130+ guests at the Elks Club and the many children in attendance were treated to game & activity stations, a balloon artist, and popcorn, slushie, and soft serve ice cream stations. Of course, hubby and I were right there in line behind the 3 year olds for slushie floats and popcorn! 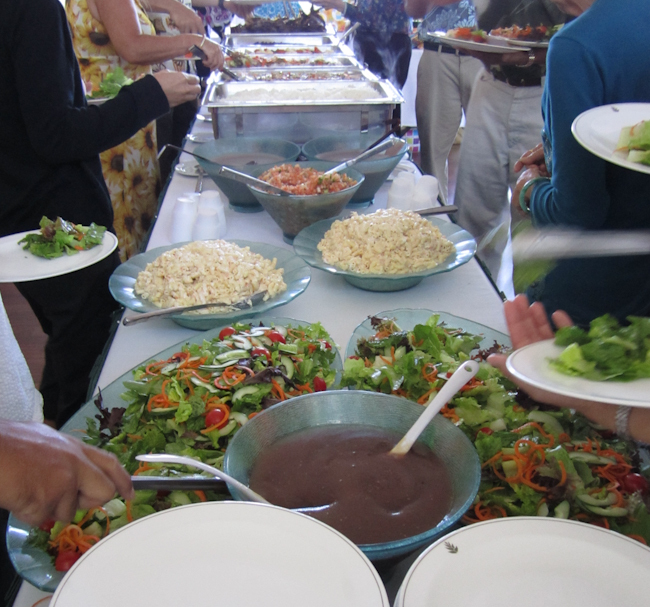 Lunch was a Hawaiian themed buffet of poi, lomi salmon, mac salad, sweet potato, beef stew, lau lau, chicken long rice, and kalua pig & cabbage. 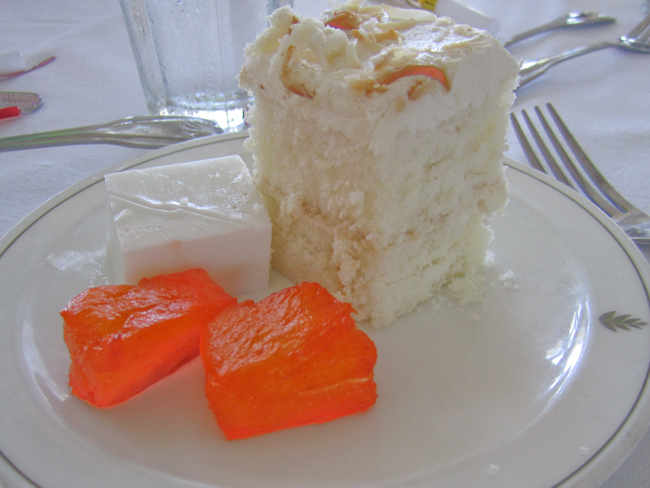 Haupia, coconut cake, and li hing mui pineapples for dessert. Yum! I’ve had the pleasure of watching the birthday boy grow over the past year, surrounded by the warmth and love of his parents, brother, grandparents, great-grandparents, and countless aunties and uncles. His mom does it all – she’s an amazing mom, wife, and dedicated to her career. Congratulations and here’s to many more celebrations to come! I picked up lunch at Yama’s Fish Market for some friends and met them at their workplace for a picnic lunch break. Yama’s is one of my favorites for take-out Hawaiian food and fresh poke. 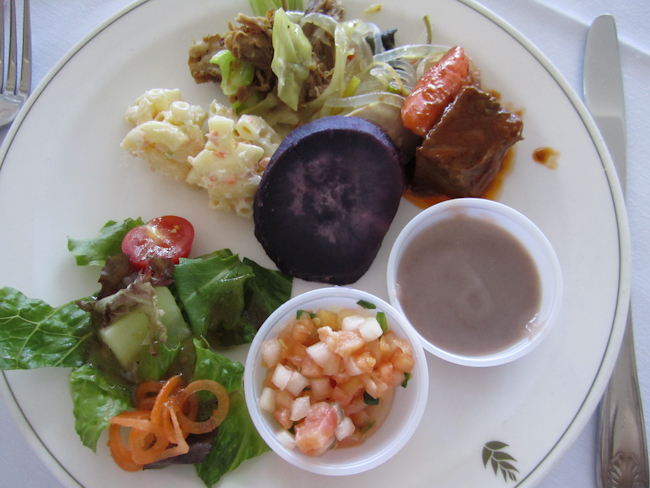 I usually get their full Hawaiian plates with lomi salmon, poi, haupia, and poke so they run over $10.00, but I didn’t realize how reasonably priced their regular plate lunches are. Other than one tiny table outside, they don’t really have a place to sit down and eat so it’s the perfect place to get take-out on your way to the beach or a beautiful park. 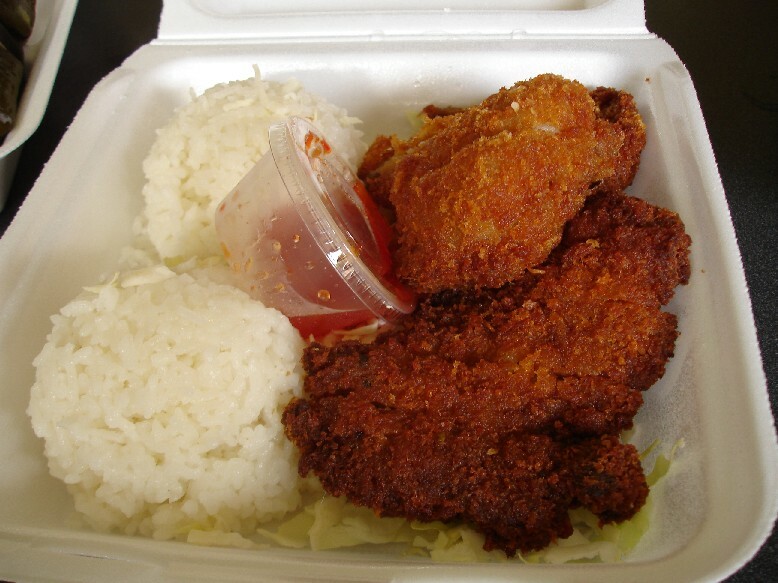 Lau Lau Plate ($5.85). 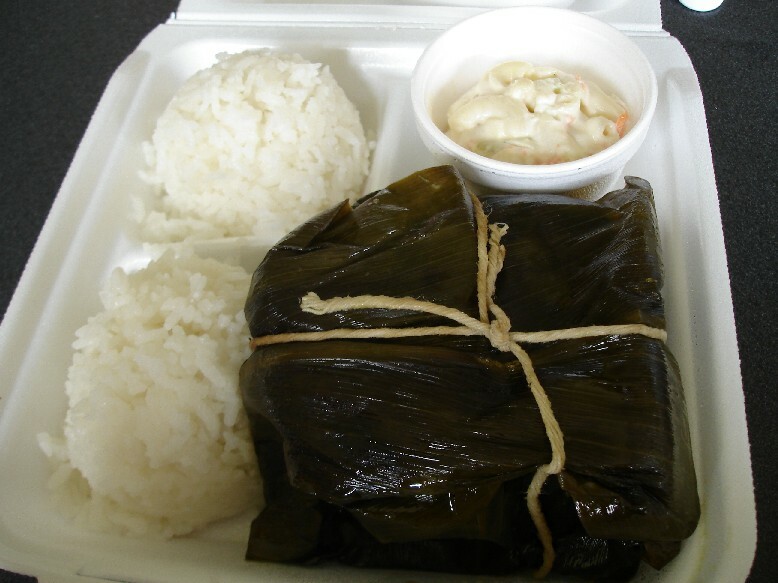 For anyone who doesn’t know what lau lau is, it’s pork (or chicken and/or fish) inside taro leaves wrapped up in ti leaf and steamed until it’s melty soft. 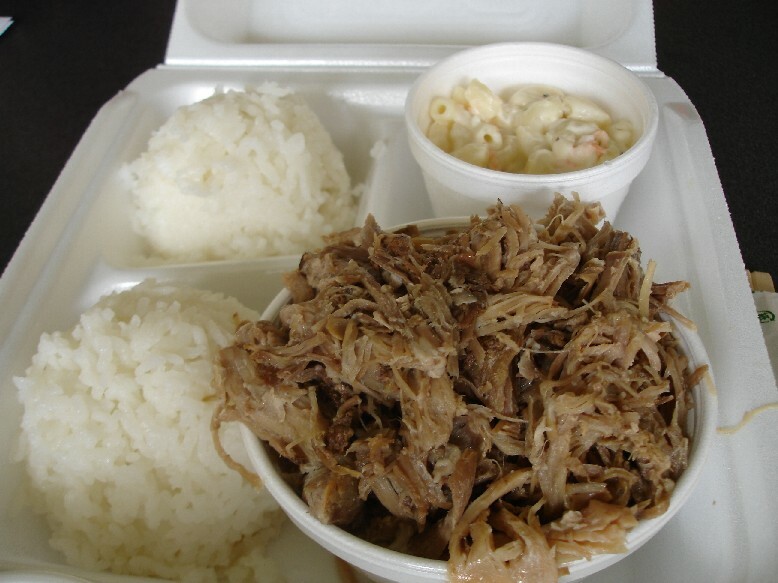 Kalua Pig Plate ($5.85). 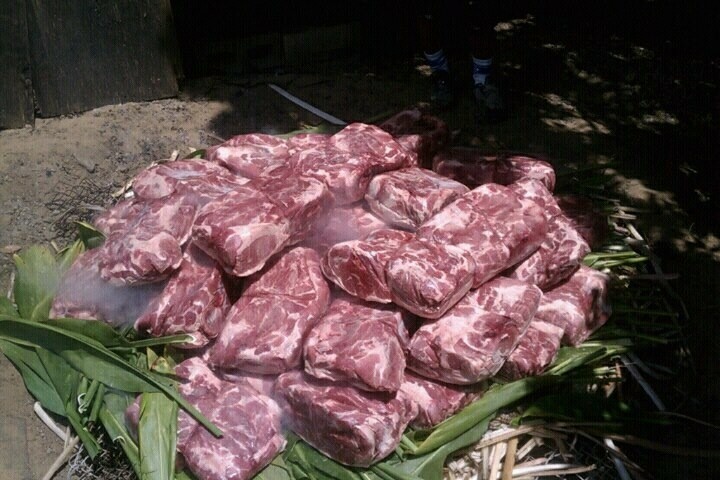 What a value for this heaping pile of kalua pig! Mochiko Chicken Plate ($6.45) served with sweet chili sauce. I was surprised because I thought they gave my friend chicken katsu instead of the mochiko chicken she wanted, but she said that’s how their mochiko chicken is. It’s crusted with panko which is unusual to see. 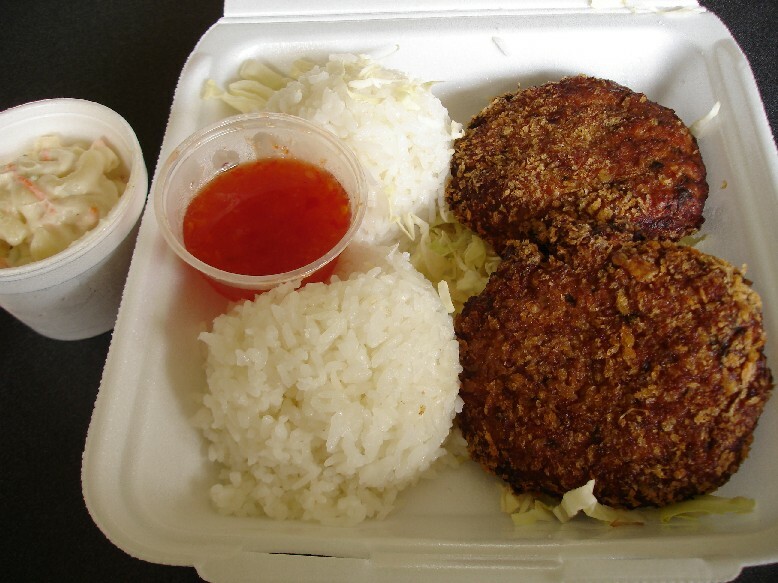 My Ahi Poke Patties Plate ($6.45) with sweet chili sauce, one of their specials for the day. I wasn’t sure what I’d be getting, but these panko-crusted ahi poke cakes (limu and all) were delicious. I thought they might be seared rare but FYI, they were cooked all the way through. It was a cheap but most delicious lunch! 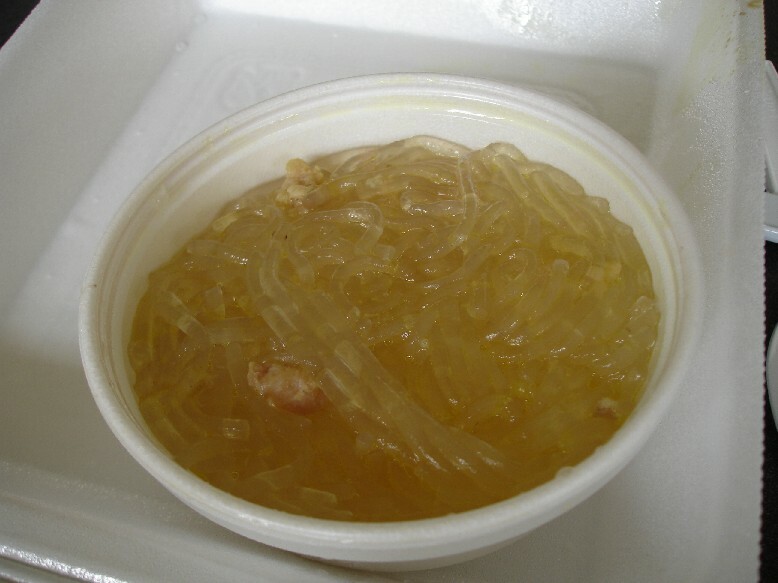 Click here to view the menu on their website.